An interview with Sayaka Akiyama. 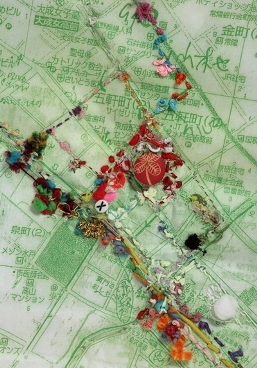 Sayaka Akiyama "Taking a Walk: Nippori-Higure-Yanaka"
Sayaka Akiyama is a humble visual artist whose work is truly glocal: firmly rooted in the local environment while addressing global issues at the same time. I encountered Akiyama just before sunset in front of Higure gallery playing with a cat on the sidewalk amidst a myriad of potted plants. After a month residing in the Yanaka neighborhood Akiyama was so immersed in the slow-paced ambiance of this shitamachi, it was as if she had forgotten it was the closing day of her solo exhibition next door at Higure 17-15 CAS. In fact she takes up residence in nearly all of the neighborhoods where she exhibits, slowly absorbing the local ambiance while making new site-specific works. Akiyama spoke calmly about her work and artistic process while sitting on the white gallery floor with colorful string and cloth surrounding her. First of all I want to ask you about the relationship of your handmade objects with your concept of walking, how did this connection start and how has it developed? I was a painter at first, but I realized painting didn’t capture the reality of things for me. I felt the need to express myself in another way so I took a drawing class in college. I chose to draw my own movements on completely white paper, one by one, recording the direction of my footsteps. A little diagonal, straight, and then diagonal—I just made about ten dots with a pencil. With these ten dots I established a vivid reality that went beyond painting. In these actions you went outside of the usual definition of painting and found a sensibility that felt closer to life? I personally liked oil painting a lot and did it at the same time, but as much as I could do it, the action of walking felt more real as a work of art. I recorded one month’s activity on a map. The action of walking became a series of dots. Using paper maps from a realtor’s office I drew dots in pencil. But these were completely uninteresting. How about sewing, I thought. Now I sew colors that express my movements. Even though I am totally bad at working with cloth. Really? It doesn’t appear that way! Now that I’m making this style of work I have to say some people might think: wow she must be talented at handicrafts. But the truth is I had no idea this is where I would end up. I was never conscious of working as a craft artist. In this method of expression there are people who do embroidery, but I don’t see myself as an embroiderer at all. I am just concentrated on daily life and make something that feels like notches to mark the way. I was a painter early on but I gradually discovered that a needle and thread were more direct than a brush and paint. In the flow or your work process how exactly did you shift from the brush to the needle? In the beginning I wasn’t able to do it, but slowly I got used to doing it. I still can’t make things like clothing. I’m not a craftsperson at all. I want to ask you about the works you did in Germany, now touring in the show “Neoteny Japan”, the collage works accompanied by hand-written text. Are they records of your impressions after walking? What relationship do they have with the walk itself? The first thing I do is write sentences. I bring a memo pad, go to a place, and record an experience. For example today I met a cat and played with it—it’s a grand experiment in the habit of documenting everyday activity. Yes, very similar to that. I’ll write something like, “I played with a cat.” Then from that I make the work. I always collect my first impressions written by hand, and then edit them on the computer. But the computer makes the words too objective, boring, so I write the sentences by hand again on the gallery wall. How do the sentences evolve as you move from the early descriptions to the final words written on the wall? It’s the same story from start to finish, but the final version is more poetic. I intentionally avoid the past tense, putting all of it in the present tense. When you work on an exhibition abroad how do you get a sense for the place? Of course, making the work on site is crucial. The viewers recognize areas on the map and find the movements interesting. If it’s a place you aren’t familiar with, for example German people looking at a map from Tokyo, it’s visually intriguing but the words are different and it’s hard to understand. Can we talk a bit about the new work you are showing at the “Neoteny Japan” show at the Niigata Prefectural Museum of Modern Art? These pieces are composed of little trinkets from shoe stores, outdoor shops and markets. I attach them to the cloth. 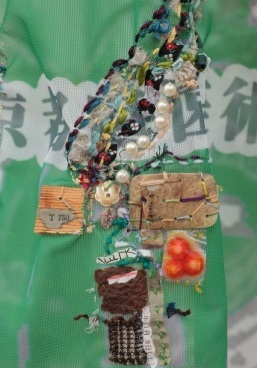 Do the objects that you sew into the works correspond directly to the spot where you found them? Yes. This area is the museum, full of all kinds of things that I found because I spent so much time there. And here are lots of bright shiny colors because there was a candlelight event held there that impressed me. I chose bright colored things that go with the candle feeling for that area. And here is a train schedule from the station that was there. The rice is quite famous here so I also included this key holder. What about the dots going along this road? What do they signify? They are records of where I move, walk and go in daily life. Like here there was an ito-ya where I found all sorts of little objects. It was a very old ito-ya where I met this woman. The museum was in the countryside so I went to Jusco a lot to find things like this pink plastic toy. The Jusco stood out in the countryside like a bright thing so I chose pink. It was raining that day. So you select each object one-by-one based on your observations and feelings about that place? Yes. I don’t have a driver’s license so I often move around by bike, train and bus for this walking project. The works are called “walk” but more generally they are all about movement, from here to there. This is the way I express the passing of time. Why do you steer away from literal documentation such as video and photography? Since I was a painter I like to express myself in the movements of the hand. As far as handmade things go, the most important aspect is the concept of “a walk” because I’m not interested in making beautiful things. I’m now thinking I’ll try to record this concept with video or other ways of documentation. Ten years from now it could change. But now I make things by hand. 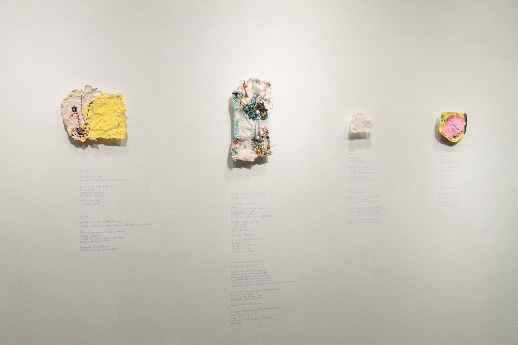 Sayaka Akiyama’s works can be seen in two group exhibitions this summer: “Stitch by Stitch: Traces I Made with Needle and Thread” at the Tokyo Metropolitan Teien Museum in Meguro from July 18-September 27, and the traveling show “Neoteny Japan: Takahashi Collection” at the Niigata Prefectural Museum of Modern Art from July 21-September 10. TABlog also reviewed “Neoteny Japan” when it was showing in Tokyo.